What’s more festive than chaotic chemistry experiment? That’s right, NOTHING, so step up and prove yourself if you want to pass your potions exam! In Potion Explosion, each player is tasked with proving their potion making skill. You’ll need to collect ingredients, manage your supply and make clever use of the potions you create if you want to get ahead of the game. Luckily you have your Headmaster around to help you out, although I’m not sure how much I’d trust an insane Dumbledore. Seriously, can we have Snape back now? You start the game with some basic potions you need to brew, and as you collect the ingredients you need you’ll be tasked with more complex (and more valuable) potions to complete. How do you collect ingredients, I hear you ask? What a good question, young witch or wizard, step this way. All the ingredients you need are stored in this dispenser, and on your turn you can take any one ingredient that you want to help you complete your potion. Thanks to magic/gravity, the ingredient marbles will cascade down the slide when you do this. If you cause two or more of the same colour ingredient to collide then you trigger an explosion and can take all of those marbles as well. If you’re skilful enough you may even be able to cause two or three explosions in a row, leaving you with more ingredients than you know what to do with! One of the joys of this game is puzzling out how to create an impressive cascade by removing just one marble. But what if it gets around to your turn and there just aren’t any good moves? That can happen, but luckily you’re not stuck if it does! On your turn you can drink any potions you’ve already completed to get a special ability – they still count for points, so don’t be scared to use them up (unless you don’t trust your own brews of course). These abilities let you do actions like removing more marbles, letting you use any colour ingredients to complete your potion, or even stealing from your opponent’s storage! It would have been easy for Potion Explosion to feel extremely luck-driven, but the potion abilities give you enough control and strategy to keep the game interesting. If I had to describe Potion Explosion in one sentence, I’d say it feels like a Match 3 arcade game jumped out of my computer and packaged itself into a nice square box. It’s colourful, it’s fast paced, it’s addictive, and it’s wonderfully tactile. Just taking a turn is a satisfying experience, being able to play with the marbles and watching them roll down the slides, and hearing them clink and crash together. Every component in this game, and every part of its presentation, comes together beautifully to enhance the gameplay. I love the puzzle of trying to find the move that will get me the ingredients I need, and I really enjoy the player dynamics in the game. There’s no direct interaction or conflict (other than the potion that let’s you steal ingredients), but there’s a playful tension as you’re eyeing off the move you really want to make on your turn while internally begging the other players not to mess it up for you. Personally, Potion Explosion is best with the full four players. You do have slightly more control with less people in the game, but it’s just more engaging as you add more players in. There’s more competition for the skill tokens (awarded for brewing certain sets of potions), there’s a higher turnover in the dispenser so the game doesn’t get stale, and you have more social dynamics at play. Why not fit a harvest festival into your Christmas festivities? As an artisanal lantern maker, it’s your job to decorate the palace lakes for the festival and earn the most honour for your contributions. In Lanterns, each player is trying to earn sets of coloured lantern cards (either four of one colour, three pairs, or one of each of the seven colours), and dedicate those sets for points. 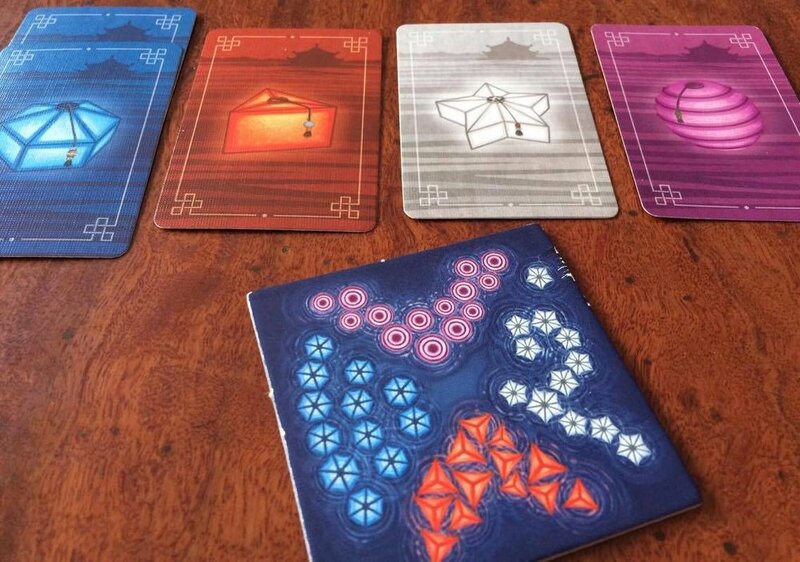 At its heart, Lanterns is a very simple tile placement game. On your turn you choose a tile from your hand and place it next to any other tile on the board. Once you’ve placed, you get a lantern card of the colour on that tile that’s facing you, and you can earn bonus cards for matching the colours on your tile to tiles already on the board. The twist that really makes Lanterns stand out is that every other player also earns a card from your placement, of the colour on the tile that’s facing towards them. This adds a really interesting element to the game where you’re not only trying to gain the colours you need, but also thinking about what your opponents are trying to do and denying them the cards they’re trying to collect. That’s basically the entire ruleset. There’s one extra thing where you can earn favour tokens that let you swap your lantern cards by matching to pagoda tiles (tiles with the square image in the centre), but that’s it and that’s one of the reasons why I like Lanterns so much. It’s such an elegant game that you can teach new players in under five minutes, and it is genuinely relaxing to play. The game flows quickly, and while you’re competing with the other players it doesn’t feel competitive. Yes, you’re racing to collect the set bonuses (each set decreases in value as people claim more and more of them), but you never feel an urgent need to optimise your strategy or even to win, and it’s really enjoyable to play because of that. If you’ve seen my reviews you’ll know I love my heavy strategy games, but it’s nice to wind down with a beautiful game and just appreciate playing. And that’s the other reason why Lanterns is great – it’s just so pretty. It looks gorgeous on the table, and I really appreciate the attention to detail in the art. One of the first things I noticed was that the top-down view of the differently coloured lanterns on the tiles matches how they actually look on the cards – it’s such a small detail, but I’m still impressed by it. Lanterns is such a perfect chill-out game, and it’s fun no matter how many people you play with. There’s no time for dessert, you can have pudding after you rebuild your flying machine! 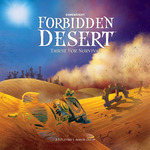 Forbidden Desert is a co-operative game that starts with you crash landed in the middle of a desert, with no help in sight. Working as a team, you need to explore the sand dunes to find the scattered pieces of your ship and clear the path to your escape location, all while making sure everyone has enough water to survive the scorching sun. To help you complete your task, everyone will play an adventurer with a powerful unique ability – for example, you might be able to collect water more easily to share with other players, or move around the board more quickly. On your turn, you can spend your actions on tasks like moving around the board, exploring tiles, or clearing sand. At the end of your turn, you have to draw cards that will most likely undo all your hard work by adding more sand to the board, shifting tiles around or making everyone use up a little bit more of their dwindling water supply. Like any good co-operative game, Forbidden Desert only has one way to win but many ways to lose, so the fun of the game is figuring out how to hold off all of the ever-present threats for just one more turn without being overcome. Of course you need to work on finding the parts of your ship, but make sure you don’t neglect the sand that’s building up and restricting your movement, or the fact that your water flask is running dry, or the constant tick tick ticking of time as you take too long to win the game. Forbidden Desert is not only an excellent strategy game, but is also extremely approachable because of how it combines the challenge with a fun sense of adventure. It consistently became a favourite with the kids I played it with (some as young as 7) because they kept wanting to beat the game, and to play even better once they’d managed to win. It’s such a tense game, and does an excellent job of keeping you coming back to try again and again until you taste the sweet taste of victory. Even better, you can actually see younger kids learning to work together as they play, and changing their strategies to focus on the group rather than themselves. It also has adjustable difficulty, so you can make the game easier if you’re playing with younger kids or more difficult if you’re playing with a group that’s familiar with the game. There are also six different adventurers you can play with, and the variety means that every game feels different depending on which abilities you’re using. I’ve talked a lot about playing Forbidden Desert with children, but that’s only because it’s the only game I’ve played with younger kids that has had a 100% success rate. It’s actually a fantastic game for all ages. It’s so easy to learn and so difficult to win that it will keep you addicted – just make sure you’re prepared for the game to kick sand in your face. Code Code Code! Merry Christmas! (Sorry, that’s the best pun I have for this one) Codenames is a party game that quickly snuck its way into my top 10 games of all time, and has stayed up there for over a year now. I was honestly shocked at how much I love this game, but love it I do. At its heart Codenames is a team-based word association game, with each team trying to identify their words on the board first. Every game, a 5x5 grid of random word cards will be laid out on the table and one person on each team (the spymaster) will look at a card that identifies which words belong to which team. The spymasters need to give clues to their teammates that point to their words, while trying to avoid associations with any of the other words on the board. All the spymaster is allowed to say each turn is one word and one number. The word is the clue, something that connects or associates with multiple words of their team’s colour, and the number tells the team how many words are connected to the clue. For example, saying “water: 3” would tell my team that there are three words on the board to guess that are somehow related to water. Everyone else on the team has to put their heads together to try to figure out what the heck the spymaster is on about. I love Codenames because it’s such a chameleon of a game. It can be entirely silly or ridiculously clever depending on what you want it to be. You can play in a smaller group and take the time to make careful clues and witty wordplay, or you can play in a huge group and have it devolve into mayhem with guesses flying everywhere. It’s a game you can spend a lot of time thinking about or play casually over a few drinks, and either way you’ll have an amazing time. I literally can’t think of another game with that versatility. Codenames also has a lively social dynamic, and it generates nice amounts of tension towards the end of the game where you know there just HAS to be a way to link those last few words together and claim the victory. When you manage it, you get an amazing sense of satisfaction – I still remember combinations of words that I was particularly proud of connecting together for the win. There’s also the fun choice of playing it safe with a few words at a time, or going for broke by trying to get your teammates to guess five at once (If you’re all on the same wavelength and can pull it off, oh boy it feels good). I enjoy Codenames so much that I’ve played it for three hours straight, despite the games being so short. It’s immensely replayable because of how many words come with the game, and it’s quick enough that you can easily play multiple rounds to try different teams and spymasters. Personally, I wouldn’t play with less than 4 people (you can but it’s a very different game in a bad way), and 6-8 is ideal unless you’re happy for the game to devolve into complete chaos. One final consideration is whether to buy Codenames or the more recent sequel, Codenames: Pictures. Pictures plays exactly the same way, except that you’re trying to connect surreal images with your clues instead of words. Pictures was a disappointment to me after the original because I absolutely love the puns and wordplay that Codenames encourages, but the groups I’ve played with have been equally split between the two versions. If you’re more of a visual person, you might prefer to give Codenames: Pictures a whirl. This may not be your traditional Christmas dinner but trust me, it’s definitely better. Sushi Go Party! is an expanded version of Sushi Go! which came out a few years ago, and ohmygosh it’s just so good. This is a card drafting game (pick one card to keep, pass the rest of the hand along to your neighbour) where each player is trying to score the most points by eating the best combinations of sushi cards. No, you can’t just enjoy a nice meal, there MUST be a winner! Each type of dish scores differently, so you need to think about which cards are best for you while also keeping an eye on your opponents and denying them the cards they need. For example, some dishes score points for whoever has the most of them, while others give you more points the more of them you have, and some just give you a flat number of points. If your neighbour already has four dumplings, you don’t want to be the person who hands them another one! I’m a fan of even the original Sushi Go! because it’s such a quick, easy and fun game to jump into. Everyone chooses and reveals their cards simultaneously, so there’s no waiting around for people to finish their turns. Every player is constantly engaged in the game, and engaged with what their opponents are doing as well, so the whole game is a very fast-paced social experience. The only issue I had with the original game was that it became predictable after a lot of plays because you use the same cards each time. This is where Sushi Go Party! steps in to steal the spotlight. The Party version improves on the original by adding more than twenty new dishes that you can mix and match every time you play. Each of these scores differently and adds new twists into the game, while still retaining the streamlined gameplay of the original. This modularity means that you’ll need to use new strategies every game based on the combination of cards in play, keeping the game fresh (ha!) and preventing seasoned (HA) Sushi Go! players from getting bored with the same choices each game. Party also lets you play with more people (the original seated a maximum of 5), and adds in nice touches like a scoreboard, and a modular central board so everyone can see the cards in play. Sushi Go Party! is quite possibly the most adorable game ever and, fair warning, it will make you want to eat sushi. The art is playful, and makes each type of card so cute with its own unique personality (although it leaves you really conflicted about whether you want to hug it or eat it). Beyond its appearance, Sushi Go Party! is a wonderfully streamlined drafting game that works surprisingly well no matter how many people you play with. The original Sushi Go! fell flat for me with two players, but Party lets you adjust to play with cards that are more interesting for smaller groups. Helpfully, the game comes with suggested “set menus” of cards to use, including recommended sets for two player only games, large groups, groups who like conflict, groups who like chaos, and so on. This is fantastic for optimising your experience based on your group and personal preferences, and makes the game flexible for any situation. Sushi Go Party! is such a fun, lighthearted game, and it is honestly perfect for just having a good time with friends and family. So there you have it, my top 5 recommended games to enjoy over the holidays!